Switch up your wrap game! 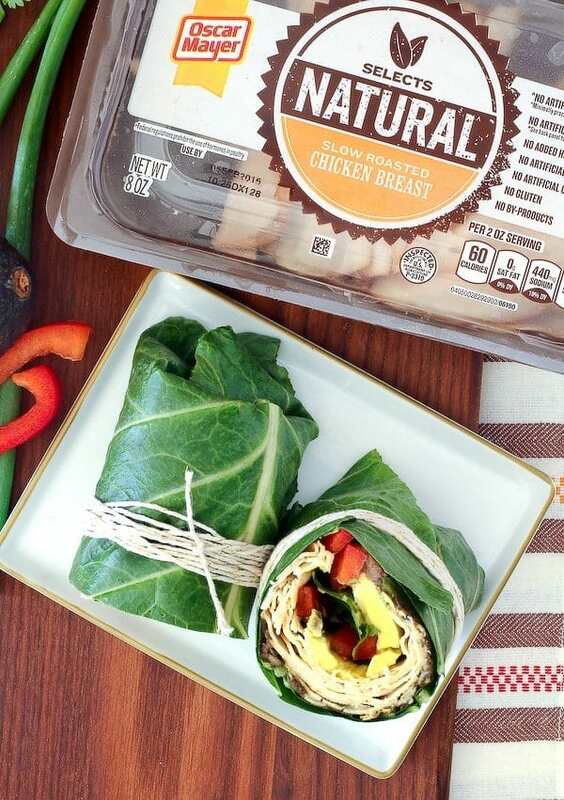 This southwestern collard wrap envelopes chicken, beans, red peppers, avocados, and more in a crunchy, satisfying, and colorful wrap. As I mentioned before, I’ve been trying to watch what I eat a little more carefully – more fruits, more vegetables…more balance overall. That involves smart swaps like a collard green wrap instead of a white flour tortilla or thick slices of bread. 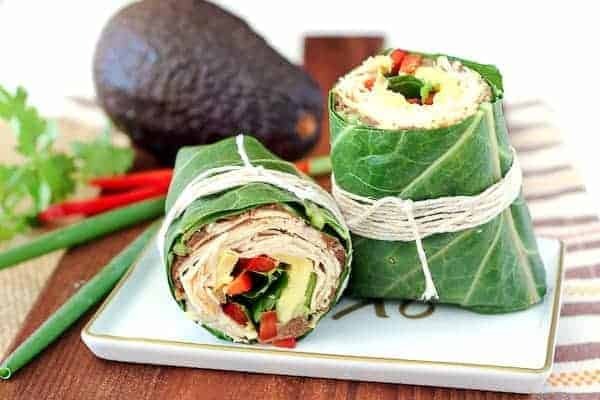 I’ve been seeing collard wraps all over the internet (I think Ali’s Instagram was one of the first places I spied them) and have been very intrigued by the idea of them. 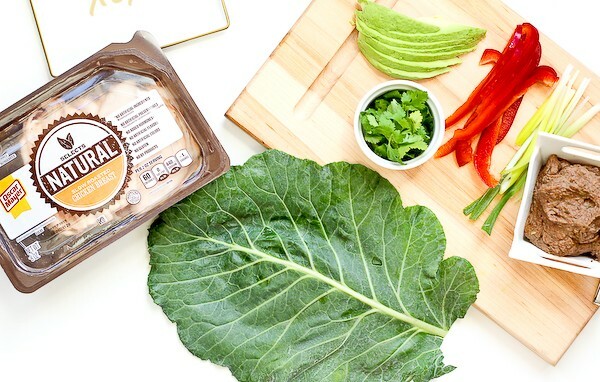 I teamed up with Oscar Mayer Selects Natural line of products to bring you this unique and flavorful collard wrap. Oscar Mayer Selects Natural is made with no artificial ingredients and is minimally processed. That means Selects Natural has no artificial preservatives (the back side of each package lists the ingredients used to preserve quality), no artificial flavors, no artificial colors, no gluten and no by-products. Three cheers for that, right? It’s certainly not easy to find cold cuts that can boast those traits. They are available in five varieties including Slow Roasted Turkey, Applewood Smoked Turkey, Slow Roasted Chicken Breast (used in this recipe), Applewood Smoked Ham and Slow Roasted Roast Beef. I was worried that the collard green as a wrap would be a little tough to bite through but to my pleasant surprise, it was not! The key is to trim the middle stem. It’s a bit of an art, but once you get the hang of it, it’s not too hard at all. You’ll want to flip the collard leaf over so it’s upside down and then carefully trim the bulk of that middle stem out. This post has a couple super helpful pictures if you’re having a hard time envisioning what this looks like. Into this collard wrap went some of my favorite things. 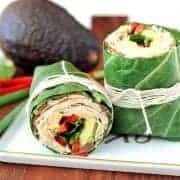 Versatile chicken breast cold cuts, creamy avocado, crisp and colorful red bell pepper, flavorful green onions and cilantro, and a great black bean dip to hold things together. If you’re in a pinch and don’t feel like messing with the black bean dip (it’s not hard but I know how rushed lunchtime can be! ), you can just smash black beans with a fork in a bowl or hummus would also be fantastic in this wrap. 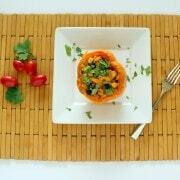 This was a filling, wholesome, flavorful lunch that I’ll be circling back around to many times. Cut stems of collard green leaves off where the leaf begins. Flip the leaves over so they are upside-down. With a sharp knife, carefully trim off the thick part of the middle stem so it is as close to flat and even with the leaf as possible. See this post for a visual. This step ensures easy rolling. Lay the collard green leaves upside-down and end to end so they are facing opposite directions. Spread bean dip onto leaves in an even layer, leaving a 1-2 inch border around the edges. Layer on the rest of the ingredients. I started with the Oscar Mayer Selects Natural Slow Roasted Chicken Breast and then added the bell pepper, green onion, cilantro, and avocado. Roll tightly, tucking the ends in, similar to the way you’d roll a burrito. Best enjoyed immediately. Verdict: Loved this! This won’t be my last rodeo with the collard wrap. Changes I would make: None are necessary at all but feel free to have fun with this and substitute in some of your favorite vegetables or flavors. You can learn more about Selects Natural and all the Oscar Mayer products on OscarMayer.com, Facebook, Twitter, and on Tumblr. Disclosure: Oscar Mayer/Kraft Heinz compensated me for the time required to develop and share this recipe. All opinions, as always, are my own. Thank you for supporting Rachel Cooks by reading about brands I use and love. I LOVE this idea! One of our favorite lunch meats….in a sandwich I can totally feel good about eating EVERY day! Been meaning to collard wraps. They’re so much healthier and have more texture too! So we just discovered the Oscar Meyer Natural Selects and besides the naturalness of them, which I love, they are seriously the BEST deli style turkey meat! LOVE them!! My four year old’s new favorite lunch is just a pile of turkey with some fruit and veggies on the side. 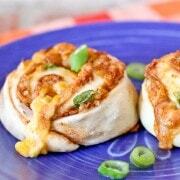 And these wraps look fantastic!! Now that’s a lunch you can feel good about! I’m glad you mentioned being worried about the toughness of the collard greens because that was my first thought as well. I’m so glad to know it worked out great. Very good idea! Thank you, Erin! I hope you love the wrap! Love how you deployed a whole collard leaf, and I buy that deli meat for lunch sandwiches and it is GOOD! Great choice. 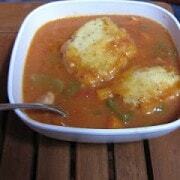 I am sharing and pinning…spread the collard love. 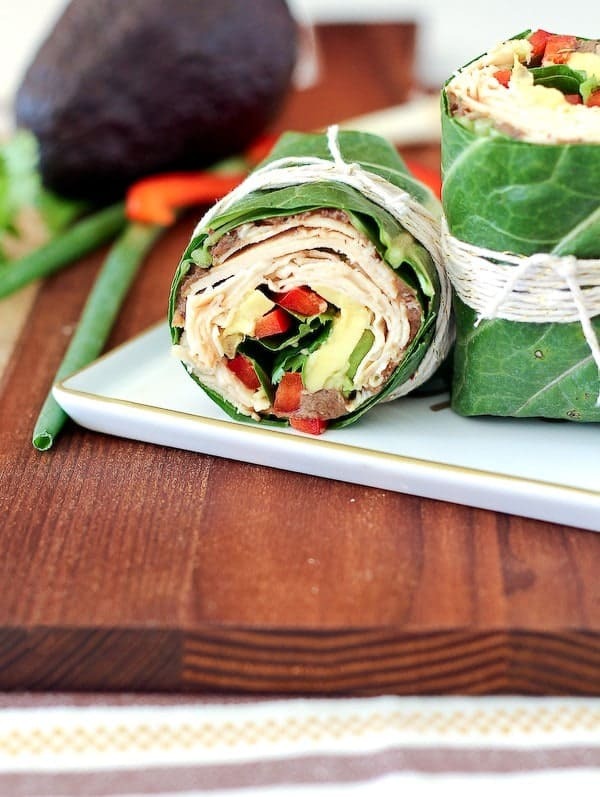 I can’t say I’ve ever used collard greens for a wrap, but I am LOVING how low carb and healthy this wrap is. I need to find this Oscar Meyer Natural because I always wonder about deli meat! Pinned!